This is an attempt to sketch out some of my/our initial thoughts on the approaches the project is considering to exposing data as Linked Data. I should emphasise that these are very much initial thoughts, and things may change as we progress. The project is dealing with two main data sources, and at the moment two different approaches are being considered to those sources. The first data source is the collection of archival finding aids describing the holdings of the archives of educational and research institutions in the UK, aggregated by the JISC Archives Hub service. 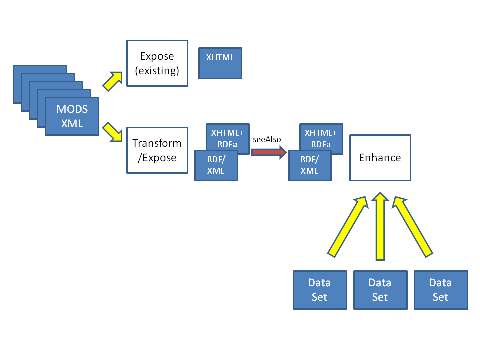 This data takes the form of XML documents in the Encoded Archival Description (EAD) format, created by archivists in the various institutions, and submitted to the Hub. Enhance: RDF data from the previous step is “enhanced” and augmented. This step might include processes to (1) generally “clean up” the data (e.g. normalise some literals, identify internal co-references etc); (ii) add links to resources in other datasets; (iii) (maybe) pull in some useful data from other datasets, either data held by the Hub but not included in the EAD docs or data from other sources. Again this will probably be a process which we extend and refine over time. Upload: Load the RDF data from the previous step to an instance of the Talis Platform triple store, which Talis are kindly making available to the project. Expose: Expose a set of linked “bounded descriptions” from the triple store over HTTP, as documents in both human-readable and RDF formats, following the principles of the W3C TAG httpRange-14 resolution/Cool URIs for the Semantic Web. The use of the Platform also provides us with a SPARQL endpoint for the data – which we can make available to others to use – and which also means we can consider layering other Web interfaces over that endpoint. For example, I’d be interested in trying out the Linked Data API, which I talked about over on eFoundations a while ago. Or indeed that a “hybrid” of the two is appropriate, and some “enhance” processes take place before upload and others take place afterwards. We’ll also need to integrate some provision for “version control” and “provenance”/”attribution” (e.g. 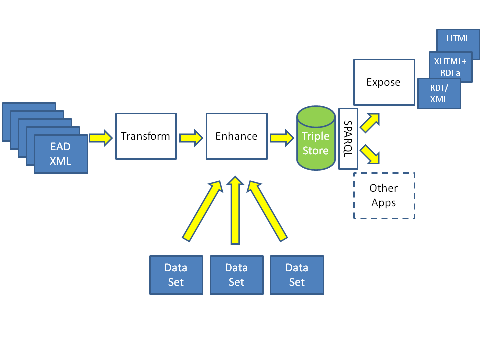 to track which data comes directly from the EAD sources, and which is added from elsewhere) into this process. 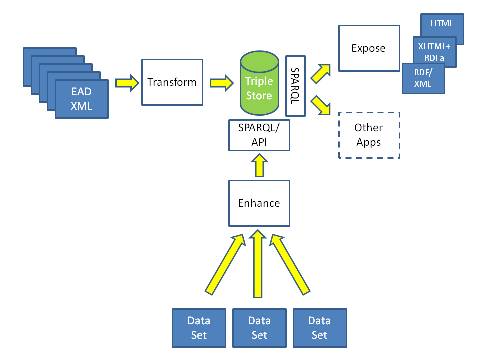 So for the Hub data, the plan is that the data is “exported” from the existing EAD dataset, and that the Platform triplestore provides the “back-end” for the app that serves up the “Linked Data” document views and provides a SPARQL endpoint. The second data source of interest is the collection of bibliographic metadata aggregated into the Copac catalogue from the member libraries of Research Libraries UK and from other specialist libraries. This data is also held as XML in the MODS XML format. (Bethan Ruddock has a couple of posts on the Copac Development blog which describe the processes by which data is transferred from the contributor libraries to the Copac catalogue). As for the case of the Archives Hub data, the first stage will be to design an appropriate RDF representation and an algorithm for transforming the MODS data to RDF (or to select – and maybe adapt, if necessary – an existing one). In contrast to the case of the Hub I outlined above, the plan is to serve the RDF data from the existing Copac database, rather than upload it to a triplestore. This will probably require the development of a small additional application (or maybe just the configuration of an HTTP server) to service the new URIs coined for resources, to support content negotiation and redirect to URIs of appropriate pages. Another constraint of this approach would be that although we can serve the set of linked documents, it doesn’t provide a SPARQL endpoint. One of the expectations for the project is that it “explores and reports on the opportunities and barriers in making content structured and exposed”, and an assessment of the pros and cons of the different approaches to hosting the data should contribute to that report.